Organized in 1891 at the Shiloh schoolhouse by members of the Baptist Church of Christ at Corinth, this church was originally called the Baptist Church of Christ at Shiloh. Charter members elected E. M. Carter as the first pastor. The church was soon renamed the Baptist Church of Christ at New Independence, reflecting its location west of the schoolhouse. 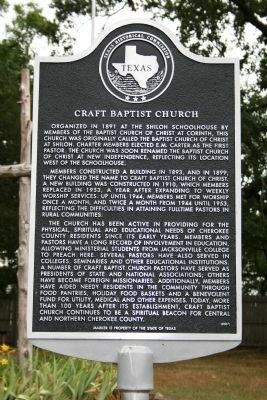 Members constructed a building in 1893, and in 1899, they changed the name to Craft Baptist Church of Christ. A new building was constructed in 1910, which members replaced in 1953, a year after expanding to weekly worship services. Up until 1944, members me for worship once a month, and twice a month from 1944 until 1953, reflecting the difficulties in attaining fulltime pastors in rural communities. The church has been active in providing for the physical, spiritual and educational needs of Cherokee County residents since its early years. Members and pastors have a long record of involvement in education, allowing ministerial students from Jacksonville College to preach here. Several pastors have also served in colleges, seminaries and other educational institutions. A number of Craft Baptist Church pastors have served as presidents of state and national associations; others have become foreign missionaries. Additionally, members have aided needy residents in the community through food pantries, holiday food baskets and a benevolent fund for utility, medical and other expenses. Today, more than 100 years after its establishment, Craft Baptist Church continues to be a spiritual beacon for central and northern Cherokee County.